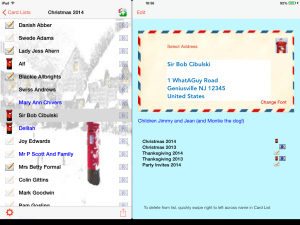 Adding cards (names and addresses) to a list is very easy. First, enter the list by tapping on the list name itself , not the ‘(i)’ on the right, which is used when editing the list name or importing cards from another list. Then simply press the ‘+’ button in the top-right of the screen. You will see that you have a choice of how to add names. Tap the Contacts icon to select names from your devices Contacts. For more information on adding names from Contacts, please refer to Adding Names From Contacts. Tap the AddressLabels icon to enter names and addresses manually, just for use within AddressLabels. For more information, please refer to Adding Names Manually. 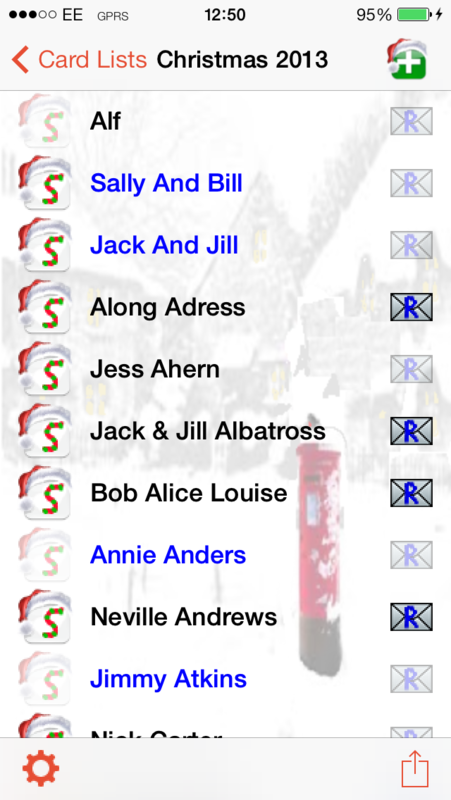 Names added from Contacts are shown in black whilst names just for AddressLabels use are in blue – refer to screen-shot below . “Mary Ann Chivers”, for example, will have been added locally to the AddressLabels Christmas list. She will not appear in the Contacts app on the device.